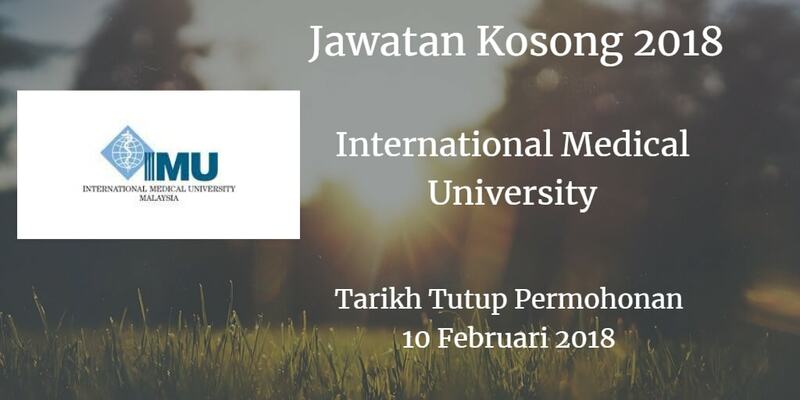 Sukacita dimaklumkan bahawa terdapat pelbagai kekosongan jawatan International Medical University ,akademik dan bukan akademik berikut. Peluang kerjaya d iInternational Medical University . degrees in the respective disciplines and with relevant working experience. Candidate should possess MBBS or equivalent qualification recognized by the Malaysian Medical Council and a post-graduate qualification recognized by National Specialist Register of Malaysia. a Master’s degree or PhD) with good academic and teaching experience. Candidates should possess MBBS or equivalent qualification recognized qualification by the Malaysian Medical Council. Candidate must also have a valid F APC (Annual Practicing Certificate) in a Malaysia. Possession of relevant clinical a experience at least 6 years and teaching experience is essential. Clinical experience. Master’s or terminal doctorate, Fellowship status or Diplomat status in a chiropractic specialty is highly preferred. Candidates must at least a Master’s Degree, or preferably PhDs (Nursing) and registered with Nursing Board Malaysia (NBM). Candidates should have current licensure to practice, post basic qualification and a certificate in methodology for nurses as approved by NBM. Candidate must have a minimum of five years clinical working experience. Board are advantage, and Pharmacist registered and trained in United Kingdom, Australia and New Zealand are welcome to apply. Salary scales would be competitive and commensurate with qualifications and experience. Please visit us at http://www.imu.edu.my/imu/ careers/faculty-vacancy/ for further details on the available job vacancies. along with their complete CV as attachment, e-mail address, contact number and names & contact details of three referees. Ref. No: FSJAo012018 in the cover letter subject column. We thank all candidates for their expressed interest; however, only those who are shortlisted for an interview will be notified.